Veronique is devastated to have mistaken this stranger for her fiancé. She needs to find the correct baron at once, but the only person who can help her is the man who makes her heart race as it absolutely should not. I enjoyed reading this book very much! It kept me on my toes and I enjoyed every single page of it. There are some twists and turns, many charming characters, a wonderful hero and an equally wonderful heroine, some not so charming characters that I would have loved to tell my mind (and a bit more) because I was so upset. And well, there are spinsters to sedu...oh, stop, spinsters, WHO seduce, at least they try to or...well, then there are marriage-minded barons and marriage-fleeing barons and of course, there's also the loving family. Well. Some of them....let's just say that I was very very upset with the way they treated Veronique even though they love her, somehow and don't even realize what they do. Seriously, right, I know that it is a fictional character but there are so many Veroniques out there and have been in every century, every country and every social class and they have suffered this kind of someitmes even loving but always hurtful treatment due to their heritage. Why can't a beautiful woman just be a beautiful woman no matter what the color of her skin? There is no shame in being "different", the only shame is in thinking that someone is inferior just due to the circumstances of his or her birth. And Veronique, well, even though I know that she is fictional, it hurt to read that such a wonderful, loving, life-embracing, sassy, courageous and strong person grew up knowing that she was considered a problem. Okay, I hope I didn't give you the impression that this book is just about Veronique and the way she was looked at due to the color of her skin because that is definitely not the case. It is a great story with amazing characters, witty and captivating with some twists and turns, that made me smile, laugh out loud, upset me and made me, well, not cry but it made my heart go out to this sweet heroine. I really really enjoyed reading this book and will definitely read it again. 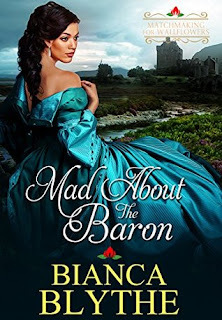 It's not the first book by Bianca Blythe that I've read and it won't be the last.